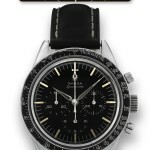 Of course a website like ours needs a page dedicated to the history of the Speedmaster Professional. But wait, what about the Pre-Pro’s? And Pre-Moons? Okay – so we’ve now explained the reason for the title ‘Handwound Chronicles’. 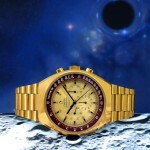 The very first Speedmaster, reference CK-2915, made its appearance in 1957. 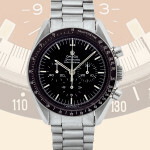 It was -more or less- part of a set of three watches, defining the ‘tool-watch concept’ like Omega never did before – it was accompanied by the Railmaster and Seamaster 300. 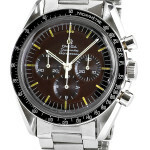 While the Railmaster was aimed at railway personnel and the Seamaster at (aspiring) divers, Omega had a different specific group of buyers in mind for the Speedmaster: race car drivers. Gentleman-racers so you will. 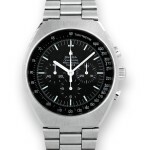 Perhaps the most defining characteristic of the CK-2915 Speedmaster was its bezel. 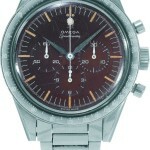 While Omega made many chronographs with a tachymeter-scale, never before was it fitted (or engraved) on the bezel. 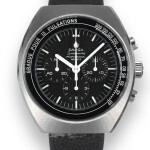 This novelty was introduced to facilitate easier and faster reading of the measured speed – and today, it is hard to imagine a racing-inspired chronograph without such a bezel! Although many transitional models exist of any generation of Speedmaster, it is safe to say that the CK-2915 is the only one to be fitted with a stainless steel, engraved bezel. 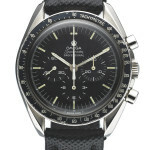 The ‘Broad Arrow’ hands are another distinctive feature, not found on any other Speedmaster until the introduction of the ‘1957 Replica‘, the Broad Arrow automatics and the BaselWorld 2013 Speedmaster 9300 1957. 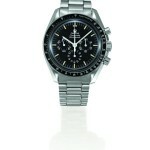 The second generation of the Omega Speedmaster, the CK-2998, made its appearance in 1959. The launch of the CK-2998 marked the introduction of the black aluminum bezel inlay, as still found today on most Speedmasters. The Broad Arrow hands were replaced by those of the so-called Alpha type. It used the same ‘straight lug’ case and the same caliber 321 movement. Note that the first three sub-generations used the so-called ‘Lollipop’ seconds counter. 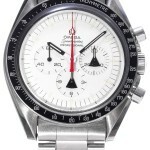 The third generation of Speedmaster was launched in 1962, although it must be noted that the term ‘generation’ might be a bit of a stretch: it was basically a continuation of the 2998-series under a new reference. Notable changes? 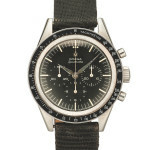 Apart from the reference number, none, although it was the first Speedmaster to be available with either a tachymeter, pulsometer or telemeter (/telemile) or decimal bezel. 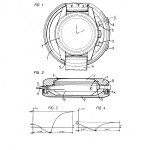 The same year that marked the introduction of the Straight Lug 105.003, also marked the introduction of the new 105.012. While still using the same caliber 321, the case was updated to the style we’re still familiar with today, with the signature twisted lugs and integrated crown and pusher protection. 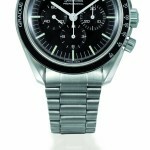 Although launched in 1963, most examples will feature the ‘Professional’ moniker on the dial, as introduced by Omega as soon as they heard of the professional use of the Speedmaster by NASA. 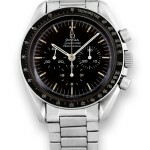 While the 105.003 can be credited for the last notable change on the dial side (the introduction of the Baton hands), the 105.012 was the very first Speedmaster to feature the case-style that’s still in use today. 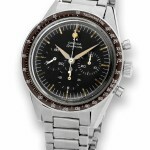 In 1963 – talk about classic design! 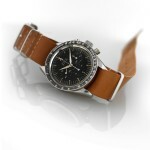 The reference 145.012, introduced in 1966, would prove to be the last Omega Speedmaster to be fitted with the column wheel caliber 321. 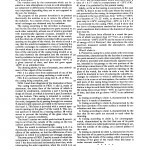 While this might sound a bit dramatic, it was in fact the continuation of the 105.012 under a new reference number, and as such it used the same case and dial as the old reference. 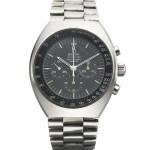 The 1968 launch of the 145.022 marked a huge change for the Omega Speedmaster – albeit not so much in appearance, but more in terms of movements. 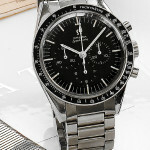 The caliber 321 was replaced by caliber 861, of which a slightly modified version (caliber 1861) is still used in today’s Speedmaster Professional. The applied Omega symbol was abandoned in favor of a painted logo. Please note -again- that many transitional models exist, and that there are hardly any hard and fast rules. 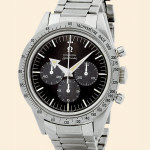 The 1969 introduction of the Speedmaster Professional Mark 2 can, in hindsight, be seen as an omen of Omega’s plans with the Speedmaster: variation. 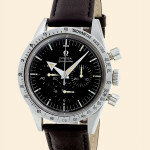 The Mark II was the first Speedmaster to use a distinctively different case design, which is often described as being a result of Omega’s quest for a indestructible case. 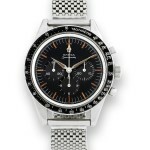 It was available with either the standard black dial or the so-called Racing version in grey with orange accents. 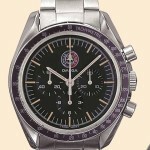 It would also prove to be a forerunner in terms of design of Omega’s crazy Seventies. A professional ‘Telestop’ version was to be added to the line-up in 1974. 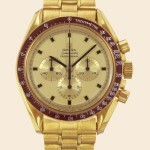 To add to the crazieness, a gold-plated version was also available – notable fact is that it used concentric subdials. 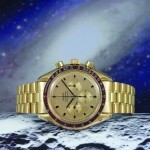 The Mark II was not the only interesting new model launched in 1969. 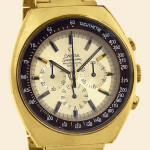 The Speedmaster BA145.022, introduced in the same year, marked another first: it was the very first Speedmaster Professional to be available in 18 karat yellow gold. 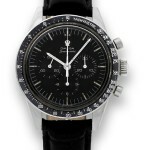 Some might also consider it the first Speedmaster to be made as a limited edition, as the first 28 examples were individually numbered and bore a inscription that differed from the retail version: to mark man’s conquest of space with time, through time, on time. In most, if not all cases said inscription was combined with a personal message to the recipient – all of them being VIPs. 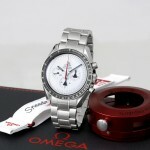 The total production number, including the first 28, is said to be no higher than 1.042 examples. 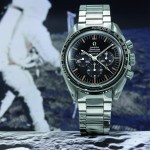 The inscription on the ‘regular’ models read the first watch worn on the moon in the center, surrounded by the circular omega speedmaster – apollo XI 1969 –. 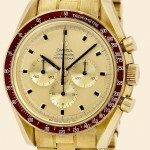 On all models, the dial was made of solid gold – as indicated by the OM SWISS MADE OM signature at 6 o’clock. Both the applied indices as well as the hands where painted black for maximum contrast. 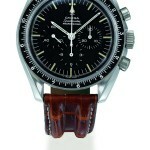 Please note that the bezel inlay was burgundy – another first: a Speedmaster with a bezel in a different color. 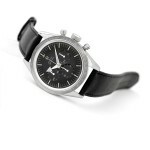 The movement, caliber 861L, was a deluxe version of caliber 861 – much like the later 863. 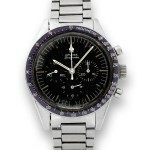 A stainless steel version of this model was also available, but for this page we’ll stick to the highlights and firsts. 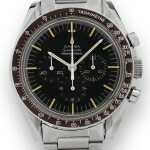 The Speedmaster ST145.0022 was introduced in 1971. Notable changes compared to the earlier version? 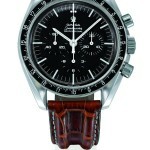 The caseback engraving, which was made in the style that is still in use today on the Speedmaster Professional. 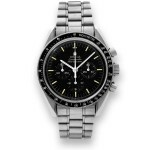 The most interesting fact is that this would prove to be the very first Speedmaster to stay in production for a long time, and it served as the base for a huge number of limited editions. 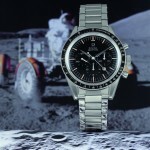 In between 1971 and 1973 Omega, Pierre Chopard in particular, was working on an interesting quest: the improvement of the Speedmaster for use in outer space. 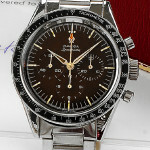 This resulted in the ‘Alaska Project’ Speedmaster, with a special dial coated with zinc oxide and a loose thermo-protective case. 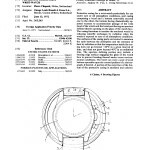 Patents for the design were granted in 1973 (Swiss CH 537170, USA US 3740944) / 1974 (Russia / CCCR SU 439100) – the US version can be found below. 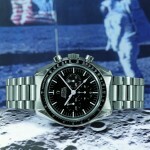 Cool and sad at the same time: Omega did not find any improvements on the standard Speedmaster necessary…. 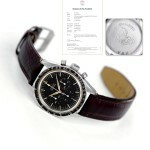 Please note that the first two watches pictured above are actually one and the same, appearing in two different auctions and losing 50% in value in between, while the third one is the 2008 re-edition. 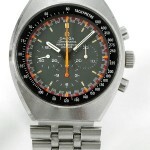 The 1975 Speedmaster Professional Apollo-Soyuz, while still being a 145.0022, introduced another novelty to the Speedmaster: the patch dial. 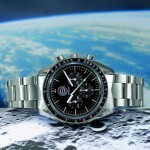 This would prove to be a lasting method of creating limited editions. Just check our Missions Series gallery – and those are probably not even half of them! 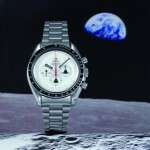 This model was made as a limited edition of 500 pieces to commemorate the Apollo-Soyuz space rendez-vous. To enjoy life to the fullest it is great to be healthy. How can remedies help up? Purchasing medications online can be a cost effective idea, as long as you do it responsibly. DIFLUCAN, most pops of a new group of triazole antifungal agents, is existing as a powder for oral suspension. Certainly it isn’t all. If you’re concerned about sexual dysfunction, you probably know about viagra alternative and otc viagra. What do you know about viagra alternatives? Other question we have to is over the counter viagra alternative. A accepted form of sexual dysfunction among men is the erectile dysfunction. Once kidney disease will lead to erectile malfunction. Prescription remedies can save lives, but they can also come with dangerous side effects. It’s essential to bear in mind that not all medicaments are healthy. Do not give Cialis or any remedy to anyone under 18 years old without prescription.